Works of the restoration of the stone apparatus of the main altar of the Basilica dei Frari has begun. 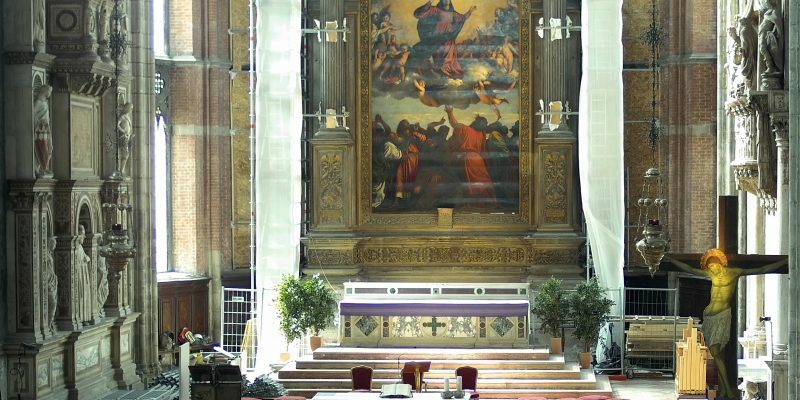 The complete installation of the scaffolding will not allow to see neither the altar nor the altarpiece until the end of the restoration works, scheduled for the beginning of summer 2021. A photographic copy of the same size of the Titian’s Assumption was prepared and we hope will make up for, at least in part, the lack to see the original. We are sorry for the inconvenience that this will bring, in particular, to visitors from all over the world, but we have to be satisfied to finally proceed with the beginning of the work, which will be financed by Save Venice Inc.
Fortunately, many other masterpieces of art in the Basilica dei Frari are awaiting you to be admired in all their beauty! More details on the general information page.